Serge Abourjeily (Diving Manager of NAD Lembeh Resort) kindly demonstrating(and explaining) cardinal fish with mouth full of eggs (mouth brooding). Flamboyant cuttlefish (Metasepia pfefferi) in Lembeh Strait, North Sulawesi, Indonesia. Canon 7D + 100mm in Nauticam Housing. 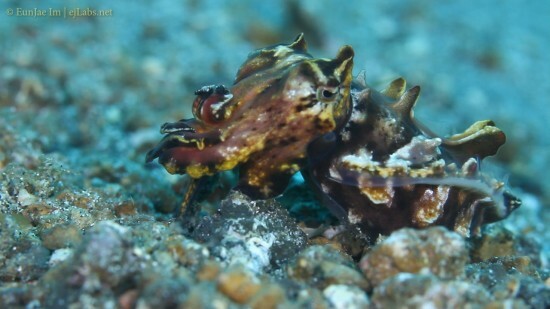 인도네시아, 름베에서 촬영한 Flamboyant cuttlefish (Metasepia pfefferi)입니다. 크기는 약 5cm정도 입니다. 캐논 7D + 100mm 렌즈로 촬영하였습니다.